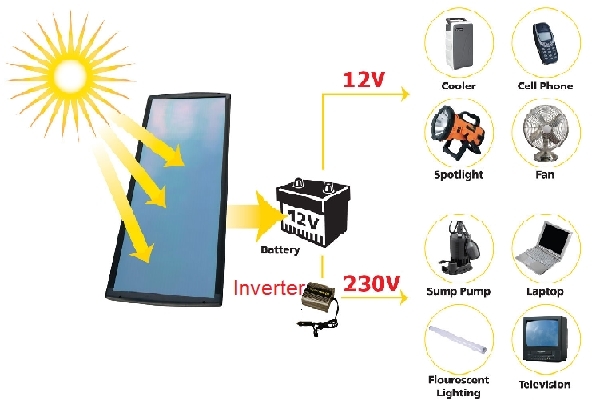 Why to use an Inverter? But then the question which arises here is that why there is a need to covert direct Current to an alternating Current? The answer to this question is the simplest one. We all know that the main electricity supplied to our homes from the power stations is Alternating current at 220 Volts. That’s one main reason that the electrical equipment which require high voltages and currents are manufactured such that they work on AC since it is supplied to our homes. Other than this, AC power is widely used and since most of the appliances require a relatively higher amount of power than DC can supply, since DC power is designed to work on low voltages. So due to the reason that the power produced by DC producing devices has to be made available to our regular appliances, we need inverters now a days. During the conversion process, the voltage is also increased. But due to Ohms Law we know that an increase in voltage also leads to a decrease in current, so the overall output current is decreased when the DC Signal is converted into an AC one. A small description of these inverters is given below so that you can know the basic difference in their working principles. In our later tutorials, they would be described the best possible detail. These are the basic type of inverters, which along with the inversion of DC to AC, also produce increase the amplitude of the voltage and hence produce a change in the frequency. The output of these types of inverters is a sine wave usually, but in some cases the output gets distorted due to several reasons and appears in the form of a modified sine wave or a square wave. 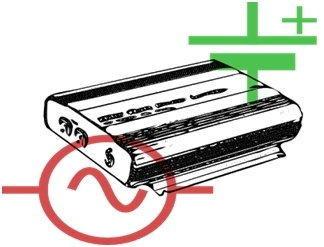 In case of Grid Tie inverters, as their name indicates, the output AC power is supplied to a grid type network, i.e. a larger scale supply unit. Afterwards, through this unit, the power is distributed further. Due to this reason they have a complex construction and internal circuitry, because they have to synchronize with the grid network. These were the two basic types. The working of an inverter will be explained in the next tutorial. So stay tuned and keep visiting us to know their working in detail along with their principles and performance parameters. or copy this trackback: http://engineering.electrical-equipment.org/electrical-distribution/what-is-an-inverter.html/trackback from your own site. Enjoyed reading your blog on inverters. My company, Prohm-tect USA produces a line of electrically and thermally conductive pastes that protect against corrosion, and reduce resistance in electrical connections. I would think that our products could give inverter connections an extra degree of protection and dissipate heat in the connections. What input can you give me? Thanks! how can i construct my own inverter??? ?help me! But due to Ohms Law we know that an increase in voltage also leads to a decrease in current, so the overall output current is decreased when the DC Signal is converted into an AC one. The above two line is incorrect , according to ohms law voltage is directly proportional to current . so how can ncrease in voltage also leads to a decrease in current?